Up to 60,000 fans will have made their way to the Isle of Wight Music Festival to enjoy the likes of Suzi Quatro, Orbital, James and a strong international line-up on grass that has been thoroughly renovated to withstand the event. Following a report and recommendations by the STRI's Alison King, Nigel Leppard, the LEA Grounds Maintenance and Development Officer for the Isle of Wight Council, who oversees Medina High School where part of the festival is held, hired Terrain Aeration in March to treat 26,000 sq metres of severely compacted sports field, prior to fertilising and over seeding. "These school playing fields are known as 'The Strawberry Fields' during the festival weekend," he says. "The first Isle of Wight festivals were held between 1968 and 1970 on other parts of the island, the 1970 event rivalling Woodstock for size. After a break and a relaxing of the Isle of Wight Act the festival returned in 2002 to the current site in Newport and since then has returned year on year. It's not just all those feet which take their toll but the festival infrastructure, the articulated lorries, telehandlers, huge Big Top marquee and the siting of lighting and sound equipment that does the damage." Steve Gingell, STRI Southern Area Manager who has been working with Alison says that deep compressed air injection treatment was one of a range of aeration processes that was recommended as a solution to the problem. "We dug a test pit and found deep compaction pans that needed to be broken through," he explains. Terrain Aeration went in with the company's Airforce, and Airforce Scamper terralift machines in extremely wet conditions inserting the probe one metre below the surface and injecting compressed air to break up the sub soil. The company then injected dried, milled seaweed on the final air blast, which swells when wet and will keep the new air channels open. "The compaction was so severe that we had to use the JCB hammer continuously," remembers David Green. "We even wore out the tip of the steel probe and had to get a replacement half way through the job." 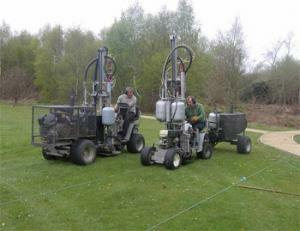 During the second week Terrain Aeration continued their one-metre deep aeration process in heavy rain. This means that the dried, milled seaweed will already be activated, expanding and contracting depending on weather conditions, and allowing surface water to drain away quickly following a downpour. This is essential if it rains during the festival. "One of the most highly trafficked areas is the thoroughfare from the visitor's campsite through the Strawberry Fields to the main arena," continues Nigel. "We targeted this section of the site along with other problem areas."